In virtually every country, the cost of healthcare is increasing more rapidly than the willingness and the ability to pay for it. At the same time, more and more data is being captured around healthcare processes in the form of Electronic Health Records (EHR), health insurance claims, medical imaging databases, disease registries, spontaneous reporting sites, and clinical trials. As a result, data mining has become critical to the healthcare world. On the one hand, EHR offers the data that gets data miners excited, however on the other hand, is accompanied with challenges such 1) the unavailability of large sources of data to academic researchers, and 2) limited access to data-mining experts. Healthcare entities are reluctant to release their internal data to academic researchers and in most cases there is limited interaction between industry practitioners and academic researchers working on related problems. All submissions must be made electronically at https://www.easychair.org/conferences/?conf=sdmdmmh2014. Workshop notes are available for download here. Uncontrolled inflammation accompanied by an infection that results in septic shock is the most common cause of death in intensive care units and the 10th leading cause of death overall. In principle, spectacular mortality rate reduction can be achieved by early diagnosis and accurate prediction of response to therapy. This is a very difficult objective due to the fast progression and complex multi-stage nature of acute inflammation. Our ongoing DARPA DLT project is addressing this challenge by development and validation of effective predictive modeling technology for analysis of temporal dependencies in high dimensional multi-source sepsis related data. This lecture will provide an overview of the results of our project, which show potentials for significant mortality reduction in severe sepsis patients. Zoran Obradovic is a L.H. Carnell Professor of Data Analytics at Temple University, Professor in the Department of Computer and Information Sciences with a secondary appointment in Statistics, and is the Director of the Center for Data Analytics and Biomedical Informatics. His research interests include data mining, machine learning and complex networks applications in climate modeling and health management. Zoran is the executive editor at the journal on Statistical Analysis and Data Mining, which is the official publication of the American Statistical Association and is an editorial board member at eleven journals. He was general co-chair for 2013 and 2014 SIAM International Conference on Data Mining and was the program or track chair at many data mining and biomedical informatics conference. 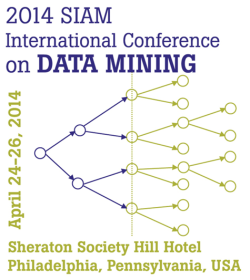 In 2014-2015 he chairs the SIAM Activity Group on Data Mining and Analytics. The healthcare system is currently in the process of transforming from reactive care to proactive and preventive care. Patients are taking an active role in seeking health information to acquire a better understanding of their health conditions and the treatments or medications they are receiving. Patients often go online to search for authoritative information or to communicate with peers who have similar health conditions. Social media plays an important role in empowering patients to acquire healthcare knowledge. The latest sensor and mobile technologies also enable patients to track their health conditions ubiquitously. In this talk, we’ll look at how the big data contributed by health consumers in social media and the increased connectivity between patients, caregivers, health professionals, and life science researchers are changing the way we conduct patient-centered research. Christopher C. Yang is an associate professor in the College of Computing and Informatics at Drexel University. His recent research interests include healthcare informatics, social intelligence and technology, and social media analytics. He has published over 230 referred journal and conference papers in ACM Transactions, IEEE Transactions, JASIST, IEEE Computer, IEEE Intelligent Systems, Information Processing and Management, International Journal of Electronic Commerce, and more. In his recent work on healthcare informatics, he is closely collaborating with the Children's Hospital of Philadelphia, UPenn Medical School, USC Keck School of Medicine, UCSF School of Medicine, Marshfield Clinic Research Institute, Johnson & Johnson. Actonnect, one of his collaboration with Marshfield Clinic Research Institute, University of Wisconsin at Madison, and a couple other institutions, has won the first place of conceptual model in the PCORI Patient-Research Matching Challenge in 2013. Actonnect is a web-based search engine and interface that aims to enable patients, clinicians, researchers, and others to conduct searches of health information gleaned from dozens of patient forums and social media sites and share their results graphically. His work has been supported by National Science Foundation, National Institutes of Health, Pennsylvania Department of Health, Children's Hospital of Philadelphia, Hong Kong Research Grant Council, Hong Kong Innovation and Technology Fund, and Hong Kong SAR Government. He is currently serving as the co-editor of Electronic Commerce Research and Applications (Elsevier), the associate editor-in-chief of Security Informatics (Springer) and the associate editor-in-chief of Security Informatics (Springer). He has edited several special issues on social media, healthcare informatics, Web mining, multilingual information systems, and electronic commerce in IEEE Transactions, ACM Transactions, IEEE Intelligent Systems, JASIST, DSS, IPM, and others. He is the founding general chair and steering committee chair of IEEE International Conference on Healthcare Informatics. He has also chaired in many international conferences and workshops such as ACM SIGHIT International Health Informatics Symposium, IEEE International Conference on Intelligence and Security Informatics, ACM International Conference on Information and Knowledge Management, International Conference on Electronic Commerce, International Conference on Social Intelligence and Technology, ACM SIGKDD Workshop on Intelligence and Security Informatics, ACM SIGKDD Workshop on Health Informatics, International Workshop on Smart Health and Wellbeing, and International Conference on Asia-Pacific Digital Libraries. Observational healthcare data, such as administrative claims and electronic health records, offer tremendous opportunities to explore the real-world effects of medical products in support of medical product safety surveillance and comparative effectiveness. However, statistical best practices have not yet been fully established for observational analyses. High-profile examples of conflicting results between observational studies and randomized trials or among epidemiologic studies, have caused concern and skepticism within the medical research community about the relative role of observational data in the hierarchy of evidence. Since 2009, the Observational Medical Outcomes Partnership (OMOP) has conducted methodological research experiments to empirically measure the performance of observational analysis approaches across a distributed network of administrative claims and electronic health records. OMOP demonstrated that traditional epidemiologic study designs, such as cohort, case-control, and self-controlled case series, can yield valuable insights about potential effects of exposure, but are all highly susceptible to biases of various sorts that can result in both false negative and false positive findings. OMOP proposed an approach through systematic evaluation and empirical calibration whereby observational study results could be interpreted in the context of their predictive accuracy and operating characteristics. Building on the lessons from OMOP, the Observational Health Data Sciences and Informatics (OHDSI, http://ohdsi.org) program was formed as a multi-stakeholder, interdisciplinary collaborative to create open-source solutions that bring out the value of observational health data through large-scale analytics. In this talk, we will discuss the opportunities and challenges for use of observational data in medical decision-making. We will highlight the progress toward establishing scientific best practices and standardized tools to enable the entire research community to improve the reliability of evidence from observational studies. We will also explore the emerging opportunities to use observational data to go beyond estimating average treatment effects to generating patient-level predictions that provide personalized evidence that’s tailored to the medical history of an individual. Data mining is used at every stage of drug discovery and development. From understanding stages of disease to understanding the mechanism of action of drugs and their effects on patients and disease, data mining is an integral part of developing drugs. As technological advances are enabling is to generate more and more data, we are becoming more dependent on data mining tools, approaches, and skills to help us derive knowledge from our data. Given the ever increasing volume, varieties, and velocity of data being generated today, we will explore the impact of data mining on drug development in this presentation and show examples of how data mining is enabling informed decision making in Pharma R&D and how big data is impacting drug development. Anastasia Christianson is Head of Translational R&D IT at Bristol-Myers Squibb (BMS) where she is responsible for delivering all IT and information needs for Translational Medicine across Research and Development. Prior to BMS, Anastasia spent 20 year at AstraZeneca Pharmaceuticals in various roles across Discovery and Clinical Development ranging from leading drug projects to establishing Genomics in Discovery and Biomedical Informatics in Clinical Development. She has experience supporting the end to end information needs across R&D for various functions including Personalized Healthcare and Biomarkers, Safety Assessment, Strategy, Portfolio and Performance, Discovery Medicine, and multiple therapeutic areas. Anastasia received her Ph.D. in Biological Chemistry from the University of Pennsylvania followed by postdoctoral training at Harvard University in Cellular and Developmental Biology. She started her working career at a Biotech Company, DNX Biotherapeutics, and has over 20 years of experience in the biotechnology and pharmaceutical R&D. She is a member of the DIA and PhRMA Translational Medicine Advisory Committees, has held adjunct appointments at various area Universities (currently at the University of Delaware and Delaware Biotechnology Institute), and is an editor of the Journal of Data Mining and Bioinformatics. She helped establish a degree program in Quantitative Biology at the University of Delaware and chaired the external advisory committee of this degree program during its establishment. She was also a member of the External Advisory Panel for the collaboration between Drexel University, the University of Louisiana, and NSF in establishing the Center for Visual and Decision Informatics. Anastasia’s passion is “data exploitation”, including mining "Big Data", for evidence-based decision making. There had been significant efforts in the last few years to improve the accessibility of patient records between disparate health care information systems. In addition to the critical challenges associated with data transformation and data integration, inferring useful knowledge using such data from different sites can introduce several challenges in terms of preserving patient privacy and transferring potentially useful knowledge. This talk consists of two parts. In the first part, we will describe new ways to transfer knowledge between different healthcare systems under patient privacy constraints. In essence, our privacy-preserving predictive models provide a novel mechanism to share knowledge acquired from the multiple data repositories without revealing the actual individual patient-specific information. These models can be almost as accurate as the models built upon centralized data repositories where the entire patient data is revealed. In the second part of this talk, we will describe a new transfer learning approach based on constrained Elastic Net method that can inherently select the appropriate features to effectively transfer knowledge across multiple sites. This approach can also quantify the difference between patient data distributions conditioned upon the corresponding predictive models. Such a difference measure is extremely critical for making the knowledge transfer decisions especially to avoid negative and unsuccessful knowledge transfer. We will demonstrate the performance of the proposed models in two important healthcare problems related to lung cancer and diabetes. The data consists of several electronic health records collected from different states and regions within the U.S. The performance of both the models using various evaluation metrics will be demonstrated and compared with existing state-of-the-art methods. Chandan Reddy is an Associate Professor in the Department of Computer Science at Wayne State University. He received his Ph.D. from Cornell University and M.S. from Michigan State University. He is the Director of the Data Mining and Knowledge Discovery (DMKD) Laboratory and a scientific member of Karmanos Cancer Institute. His primary research interests are Data Mining and Machine Learning with applications to Healthcare Analytics, Bioinformatics and Social Network Analysis. His research is funded by the National Science Foundation, the National Institutes of Health, the Department of Transportation, and the Susan G. Komen for the Cure Foundation. He has published over 45 peer-reviewed articles in leading conferences and journals including TPAMI, TKDE, SIGKDD, ICDM, SDM, and CIKM. He received the Best Application Paper Award in ACM SIGKDD conference in 2010, and was a finalist of the INFORMS Franz Edelman Award Competition in 2011. He is a member of IEEE, ACM, and SIAM. In cancer cells, the protein products of oncogenes can be overexpressed without alteration of the proto-oncogene but with shorter 3' untranslated regions (UTRs). During the past few years, RNA-seq has matured as a powerful tool for characterizing gene expressions because of its affordable cost and highly accurate digital resolution. For cancer study, the introduction of RNA-Seq technology, equipped with new analytic methods, makes it possible to capture aberrant shortening or lengthening expression patterns of oncogenes. Change-point models are a classical approach to determine whether a change has taken place and where the changes occur. This lecture will introduce change-point models for detecting aberrant gene expression patterns. We develop appropriate parametrical models for characterizing RNA-seq data. In the multiple-testing framework, we will introduce Type I error control and testing efficiency issues for pattern recognition. The numerical performances of the approaches will be illustrated using both simulation study and applications to real cancer data. Dr Zhi Wei is an associate professor at the Department of Computer Science, New Jersey Institute of Technology. He receives his Ph.D. from the University of Pennsylvania and M.S. from the Rutgers University-New Brunswick. His research interests include multiple testing, statistical modelling, machine learning and data mining with applications to Bioinformatics and genetics. His recent research focuses on developing statistical models and data mining algorithms for analysis of high dimensional data. His research is funded by the National Institutes of Health, the Pheo Para Alliance, the Henry M. Jackson Foundation, and the Robert Mapplethorpe Foundation. His methodology works have been published in prestigious journals and conferences including JASA, AJHG, AOAS, Bioinformatics, Biostatistics, PLoS Genetics, NAR and NIPS. He is an editorial board member of PLoS ONE, Frontiers in Bioinformatics and Computational Biology, and Frontiers in Applied Genetic Epidemiology. Information on the Second Workshop on Data Mining for Medicine and Healthcare can be found at DMMH-SDM 2013 website. SDM-DMMH 2014 is also featured at KDnuggets.